Compression stockings for dogs ? Do you sit or stand in one place for most of your day? At the end of the day are your legs feeling tired, heavy and achy? Have you noticed that you’re developing spider veins? Have you noticed dark, unsightly bumpy veins in your calves or thighs? If you answered yes to these questions you might be a good candidate for compression stockings to help improve the circulation in your legs! When you sit or stand still for most of the day (desk jobs, cashiers, line workers) your calf muscles don’t get much exercise. When the calf muscles are inactive, they don’t provide the usual support to the veins to help pump fluid back to the heart. Our veins need that extra squeeze from active muscles to help pump the fluid against gravity and back to the heart. When we stand or sit in one place for long periods of time and the muscles are inactive, the veins are less effective and fluid can start building up in the feet, ankles and lower leg. The veins in our legs can also become leaky if the pressure from the blood builds up and puts additional stress on the valves. In healthy veins, when our heart beats and our blood is pushed through a vein there are valves that shut to prevent the back-flow of blood that occurs due to gravity. 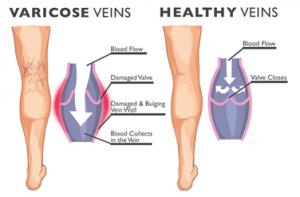 Varicose veins are stretched and looser than healthy veins, and the valves are leaky which allows back-flow of blood and the build up of fluid in our feet and ankles. Compression socks provide a graduated pressure and keep fluid from building up in our feet and ankles. They fit most tightly around the feet and the compression gradually lessens at the ankles and loosens even more around the calves. The graduated pressure helps promote the return to fluid out of the veins in the legs and back up towards the heart. The additional compressi on that these socks can also help tighten up leaky valves and prevent the back-flow of blood and resulting fluid building up in the feet and ankles. The fluid build up is what causes the heavy, tired, aching feeling that people with swollen feet and ankles feel! Compression socks can help prevent this problem and keep your legs feeling great! Compression socks are also helpful for other conditions that cause fluid to get stuck in and around the ankles. People who suffer from chronic venous insufficiency and lymphedema can also benefit from wearing compression stockings/socks. Individuals who have a DVT have a clot in their leg vein and wearing a compression sock can help reduce the swelling in the leg and make their leg much more comfortable. Wearing compression socks can also reduce the risk of developing a DVT from occurring (pilots wear them because the pressure change during a flight can make them more susceptible to developing one!). At Nottinghill Family Wellness Centre we have a wide variety of compression garments available for our patients. If you are interested in wearing them to your office job, we have stockings and work socks that look like your regular stockings and dress socks. We also have thigh high compression stockings for individuals who have dysfunctional veins in their thighs. If you like to live on the wild side, we have a number of bright patterned socks that can really help you make a fashion statement. Come visit us or give us a call at 905-827-4197 to find out if you could benefit from compression socks!